Having weather-appropriate toddler winter outerwear is imperative for keeping your little one toasty warm during unpredictable weather. From lightweight hoodies to puffer vests to down parkas, the availability of so many styles and fabrics makes selecting just one difficult. Many occasions call for toddler winter outerwear. Building snowmen or making snow angels is more fun when one is dressed for comfort and warmth. When the cold winds blow, whether you are walking from the car to the house, or taking your child sledding, you want the best protective garments for your family. Down, faux fur, fleece, and velour fabrics are good ways to keep your tot covered with style and essential warmth. To make purchasing outwear easier, take some simple measurements before you start shopping. Knowing some key body, height, and weight measurements ensures the perfect fit. Measuring for chest, waist, and hips is easy. Just measure around the widest part of the body for the chest and hips, but choose the narrowest part of the waist. Hold the tape level and firm, but not tight. Measuring a pair of pants that fit the child is much easier than trying to take an inseam measurement from a squirming toddler. Measure the pants from the crotch to the bottom of the hem. Measure the head around the circumference (above the ears and around the forehead) to calculate hat sizes. Measure height by having the child stand against the wall and making a mark where the top of his head touches the wall. The distance from the mark to the floor is his height. Have him stand on the scales to check his weight. Because sizing for children's clothing is not standardized throughout the garment industry, sizes vary from manufacturer to manufacturer. If you are purchasing online, use these measurements when consulting sizing charts. Most clothing manufacturers produce apparel in sizes two, three, and four toddlers; finding a five-toddler size is extremely rare. Once you decide on the best style for your child, you can narrow your choices down. For instance, is a hooded style best or will a hat better suit your child? Zipper closures can be difficult for younger children to handle, while button closures are usually easier and make getting dressed faster. Features like adjustable cuffs, removable linings or hoods, and wind flaps add comfort and convenience. Machine washable garments are best for toddlers who may soil their outerwear. The North Face: In addition to stocking an outstanding line of outerwear, The North Face offers a lifetime warranty on their products. Rugged Bear: Purchase durable children's outerwear at affordable prices. Save even more money by browsing their Bargain Den treasures. Best-Dressed Tot: Your child is sure to make a statement in this top quality apparel. 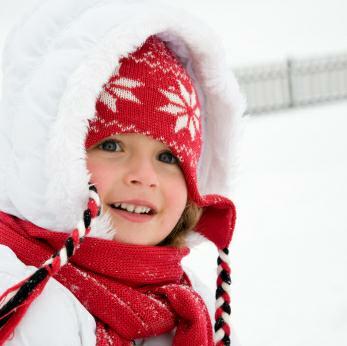 Accessorize your toddler winter outwear in a variety of ways. Matching hats, scarves, gloves, or mittens provide all-day comfort for outdoor excursions and are the perfect accent for girls' dress coats. Boots can be functional, fashionable, or a mixture of both. For extra warmth, use layers underneath outwear. Leg warmers and leggings fit nicely under snow pants, and a lightweight hoodie worn underneath a pea coat or parka helps retain body heat.